condition Upper keyboard case and individual keys have been removed and fully cleaned by hand. comments Keyboard pre-selected as good candidate and passed initial testing to confirm mechanical condition. Upper keyboard case disassembled and individual 101 keys have been removed and fully cleaned by hand. Inspection of interior plate. All 56 plastic rivets drilled out and replaced with M2 precision screws to restore internal integrity. Interior plate vacuumed to remove foreign debris. Keyboard re-assembled and re-tested post-cleaning. Individual photography of rear label. Photo gallery of typical restoration workflow. 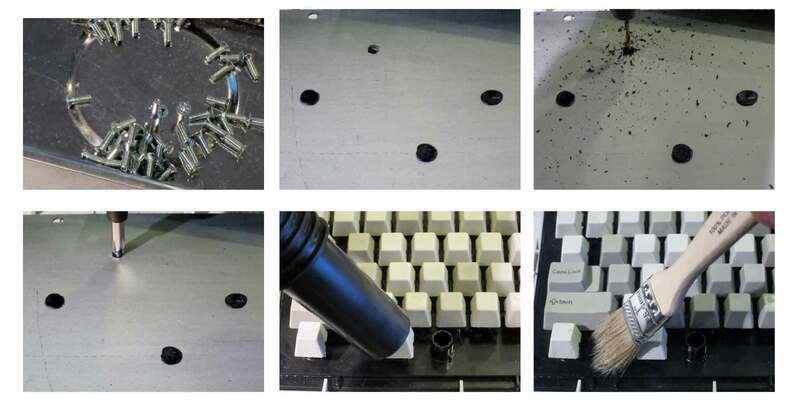 All 56 plastic rivets have been expertly replaced with M2 screws for ensure for a tight and crisp keyboard feel.